love love love H&D pears, though I haven’t had one in years. My favorite gift are the hand-decorated tiny gingerbread cookies my 92 year-old grandmother-in-law sends us every year. Congratulations! Send me an email so we can get you those pears! 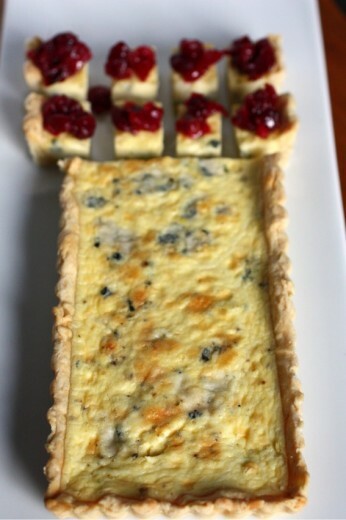 A question that I get on a semi-frequent basis is whether or not I went to culinary school. I did not. I am a self-taught cook. I learned by reading cookbooks, cooking a lot, and taking an occasional class here and there. I love taking classes and always walk away with something that makes the cost and the time worth it. I have two dear friends who attend all my cooking classes and they call all the little things they learn the “worth the price of admission tips”. My friends have offered to write a guest post with their top ten of my tips. Hopefully we’ll have that within the next month or so. Anyway, we had a vegetarian cookbook author named Lukas Volger come to Book Larder recently. He has a book called Vegetarian Entrées That Won’t Leave You Hungry. The book is great. I pick up a lot of vegetarian cookbooks and 90% of the time, I put them back down because they contain the same old recipes that I have many versions of already. Not this book. The food is different but not “out there”. Hearty but not heavy. Food I want to cook. And eat. Lukas is young and wiry and adorable. He was effortless in the kitchen but not cocky. He made three delicious dishes. (Full disclosure, I did the prep work.) When making this super tasty bulgur salad, he turned the heat up higher than I would have and got a nice char on the red onions. The onions became not just a barely noticeable background flavor and texture but a full fledged lusty ingredient in their own right. I always sauté my onions the same way, so it was nice to watch something different and then get to taste it. Lukas allowed us to all taste the salad and then we stuffed it into bell peppers that had been steamed. 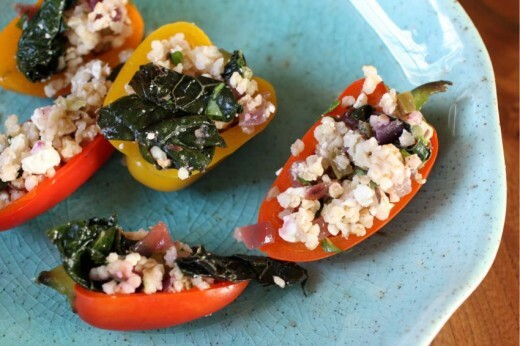 I thought it was a lovely entrée and one day, when I spied bags of little bell peppers in the produce section, I knew bite-size versions were going on my next catering menu. 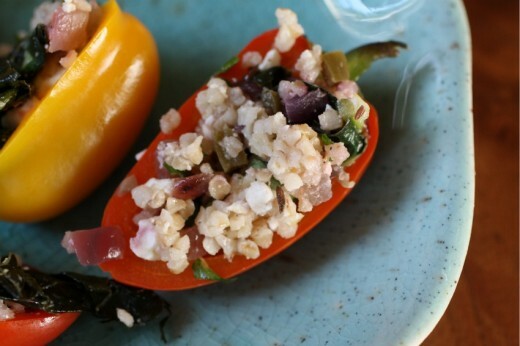 The recipe for the bulgur salad makes quite a bit so you can be confident that, even it if you use it to stuff peppers, you will get some delicious lunches out of it. 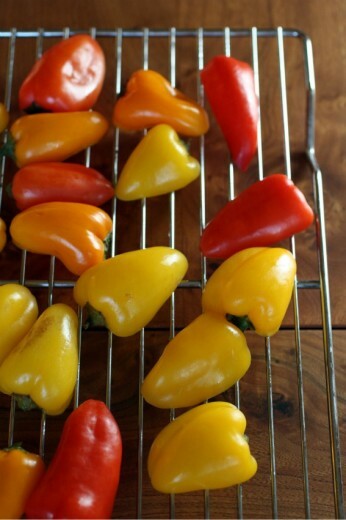 Just as an added note, you can steam peppers, large or small, by cutting them in half and scraping out the seeds and veins. Place them in a large skillet (one with a lid) and pour in a bit of water. Bring to a simmer and cover for 3 minutes, turn over and steam for another 3 minutes. When Lukas made the larger peppers in the store, he placed them, filled, in a baking dish and covered it with foil. They went into a 400º oven for about 20 minutes. I didn’t bake my small ones. If you are going to stuff small peppers, I recommend you dice the onions and cut the kale into smaller pieces so that you don’t have any bits that are too large. Combine the bulgur and water in a small saucepan over high heat. Bring to a boil, then lower the heat, cover, and simmer for 15 minutes, until tender. Strain off any water that hasn’t been absorbed. I grew up in a house with a lot of food. My family all likes to eat and I have two younger brothers, one of whom grew to be 6’4″ and the other grew to 6’1″. (I’m 5’3″. But I got the small nose gene.) My mom is a good cook and she made virtually all of our meals. Breakfast was usually cereal but she packed our lunches and made us dinner every night. She often baked so we had homemade treats for after dinner. But she never made snack food. My mother is not a snacker. Like, she never snacks. Ever. It is admirable really because I recently read that the average American consumes over 500 calories a day in mindless snacking. Ahem. 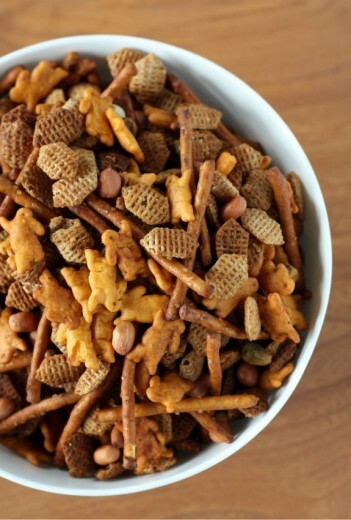 In the two months since I last made Chex Mix, I have found myself discussing the stuff more than you would expect. It turns out that I am not the only one who loves it. 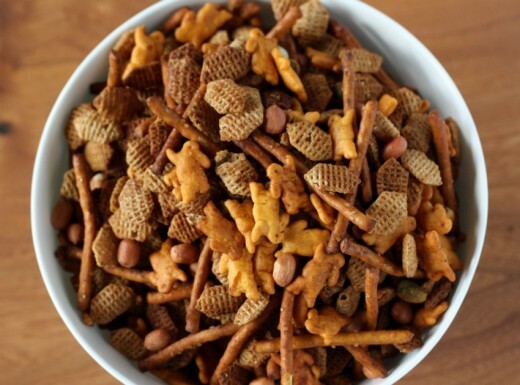 Many people have memories of taking Chex Mix on camping trips or having it around during the holidays. Why don’t I have those memories? Oh yes, the no snacking thing. It’s not that we didn’t snack – my brothers had (and have) huge appetites. Alex, my middle brother, once ate 98 shrimp skewers each with three shrimp. I can’t count that high but that’s a lot of shrimp. The boys ate a lot. So there were snacks. But not homemade. In my conversations with people about Chex Mix (what? is that weird? ), I found that people are partial to certain things being in there. Katie, the woman who waxes my eyebrows (what? is this weird too?) says that her mom not only puts all the different kinds of Chex cereal in (not just the rice), but also Cheerios and Cheerios soak up all the butter and taste the best. On the list for next time. But overall, I’m pretty happy with how this one turned out. Preheat the oven to 275ºF. 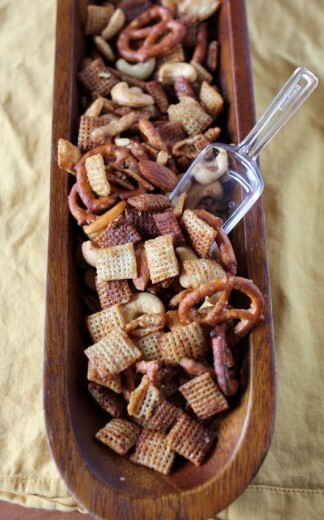 In a large bowl, combine the cereal with the nuts, rice cracker mix, sesame sticks, and pretzels. Thank you all for the sweet comments on my one, two, and three years ago posts. I will keep on keeping on! 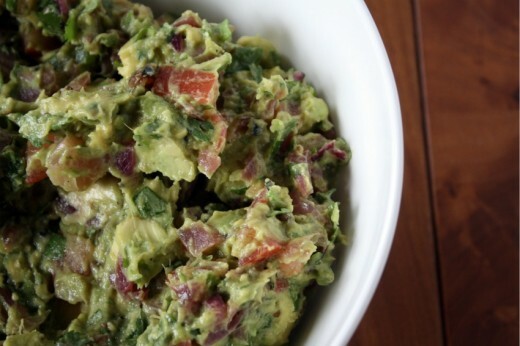 Today I have a recipe for a most special, and very different, guacamole. If you visit here regularly, you know there is sometimes a story that must be told. Feeling impatient? Feel free to scroll down to the bottom – I don’t mind. The story goes a little something like this. Four years ago, we met an artist named Erik Hall. We were looking for a painting to fill a large wall in our dining room and we stumbled upon him (in the old-fashioned way, not the internet way) at an art fair. We were struck by the beauty in his work and learned that he took commissions for paintings. Over the course of several dinners, we became friends with him and his then-girlfriend/now-wife Amy, who is a talented artist in her own right. 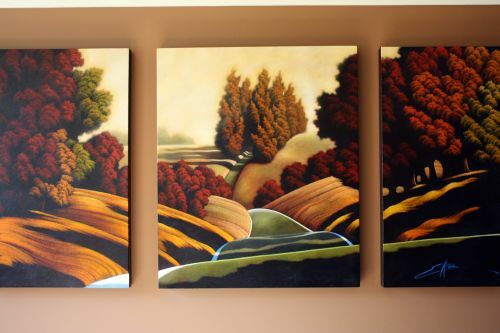 And we got the most beautiful painting, one that makes me happy every time I step foot in the dining room. Erik and Amy are not only talented artists, they are good business people with an eye for the talent of others. They have opened a beautiful gallery where, once a month, they do an opening for an artist they represent. 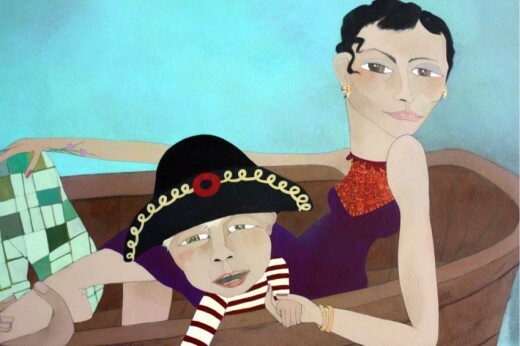 Last year, we attended several of those openings – lovely all of them. Amazing art, nice wine – but the foodie in me thought they needed a nibble. When you invite people somewhere between the hours of 5 and 7pm, there needs to be at least cocktail nuts. So I offered my services. I told them I would cater one of their parties pro bono and if they and everyone else liked having food there, we could figure out some kind of deal. 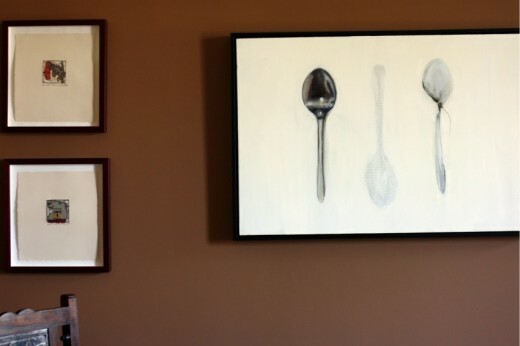 At that party, where gallery owners and visitors alike really did like having food there, I fell in love with some spoons. Not just any spoons. 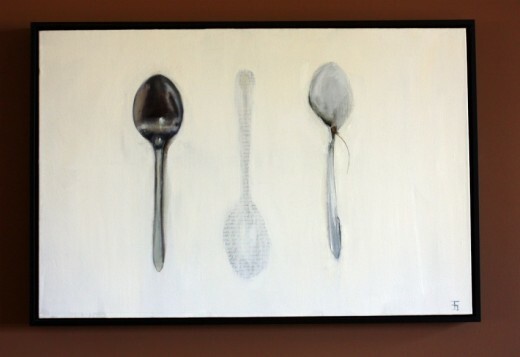 This simple beautiful painting of a trio of spoons. In a gallery full of stunning art, I was immediately drawn to this lovely piece. It was on a back wall, not even the star of the show, but I just stood in front of it, mesmerized. Which, as it turns out, did not go unnoticed by Erik. The day after the opening he called with a proposition. We could pay a bit of money for the painting and do the rest in trade. Food trade. I didn’t even ask for details before I said yes. What we ultimately agreed to was I would cater six of the year’s openings which I thought was a very fair deal. I have done five so far, Erik’s show in November is the last one, and all have been so much fun and more than worth having those spoons hang on my dining room wall ever since January. I catered last Thursday’s show and it was a special one for us. 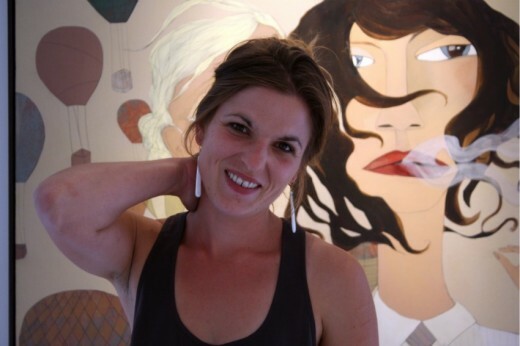 Gretchen Gammel is an artist that we have had our eye on ever since we have known Erik and Amy. Around the time that Erik finished our commissioned painting, we saw our first Gretchen show in their gallery. Gretchen features a theme each year and that year it was people in boats. 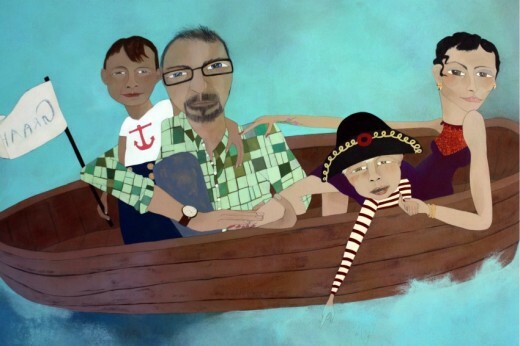 Randy, having been in the Navy, got it in his head that he would like, some day, to commission Gretchen to do a family portrait of us in a boat. The timing was tricky. She was ready, we weren’t. We were ready, she moved to France. Finally early last summer, we had her over so she could get to know us, meet the boys, get a better sense for who we are as a family. Gretchen started reading my blog too. Just before Thanksgiving, she brought us this. There are so many reasons I love this painting. The obvious of course – it’s our family. But there are so many special things she did here. She put me in purple (my favorite color) and got my tattoo (and made me look quite glamorous, I must say). She put Randy in, what we now call, a “Daddy shirt”, totally his style. Seeing Spencer, my little somewhat-tyrant, in a Napoleon hat totally cracked me up. And I think of all of us, she got Graham’s face just right. 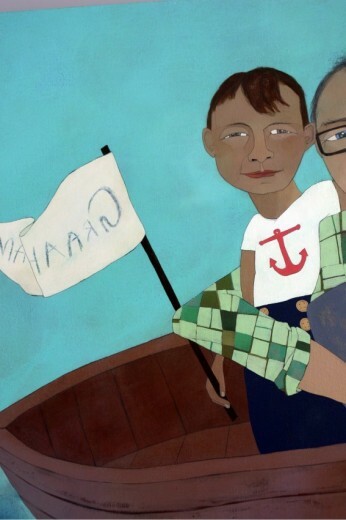 That flag he is flying behind us – well, Gretchen copied what his handwriting looked like from the photo in this post. Amazing, huh? So let’s see. Art, artists, spoons, people in boats, Napoleon hats, and now finally guacamole. I was paging through The Essential New York Times Cookbook looking for ideas for the show when I saw this recipe. I am a guacamole purist. Avocados, lime, salt, pepper, cilantro. Nothing else needed. Sometimes I will add tomatillos but even then, I feel like they are just helping out the limes with sour and acidity. Here we have onions that have been marinated and grilled, tomatoes, jalapeño peppers – all things that of course go with avocados and lime but for a moment I wondered, would it just be too much? Amanda Hesser, in her head note to the recipe, put me at ease. She is also a purist but really liked the flavors here and if it’s good enough for Amanda Hesser… Obviously, it was fabulous. A little more work but worth it for a little more oomph in something is already basically perfect. Finally, I have a theory that no matter how much guacamole you make it will all get eaten. I put that theory to the test for this party and it turns out that if you make a serious ton of the stuff, there will be some left over. Oh darn. Combine the oil, lemon juice, vinegar, cumin, salt, and pepper in a small bowl. Pour into a shallow dish, add the onion, and let marinate for 1 hour. Heat a charcoal or gas grill until hot (or heat the broiler, with the rack 6 to 8 inches from the flame). Drain the onion and place on the grill (or on the broiler pan under the broiler). Grill for 3 minutes per side (4 minutes per side if broiling). Let cool slightly, then coarsely chop, discarding any bits that have charred. Peel, halve, and pit the avocados, and cut into ½-inch dice. Seed and dice the tomato. 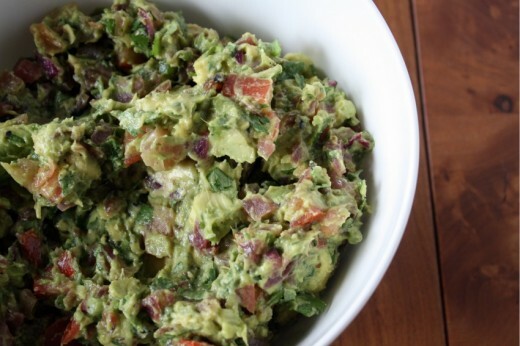 Combine the grilled onion, avocado, tomato, garlic, chiles, and cilantro in a bowl, mashing the avocado slightly as you go. Season with salt and lime juice. A while back, I wrote a post where I talked about pedestrian tastes. 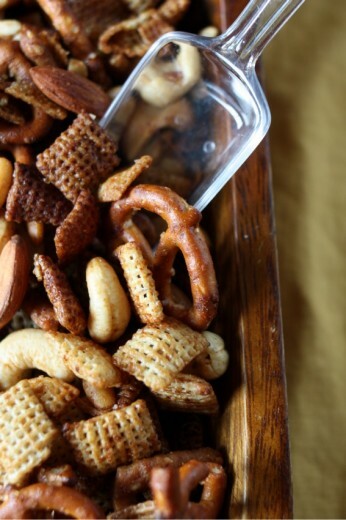 In that post, I mentioned Chex Mix as one of my, shall we say, less than gourmet tastes. We did a fair amount of driving on our little family vacation to the Delaware shore and each gas fill-up/bathroom break, those little bags of Chex Mix beckoned to me from the gas station store. I don’t ever buy those bags because they are full of chemicals and artificial everything and also because if I bought a bag I would eat a bag. Simple formula. 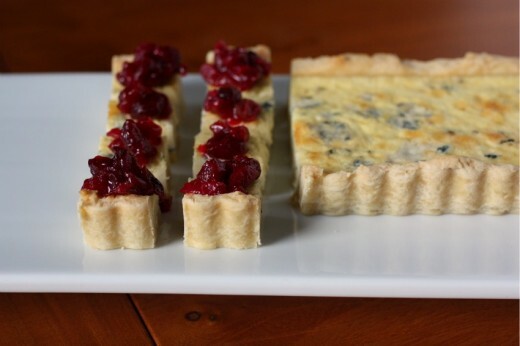 In the “appetizers” section of my recipe notebooks, I have several recipes for homemade mix. 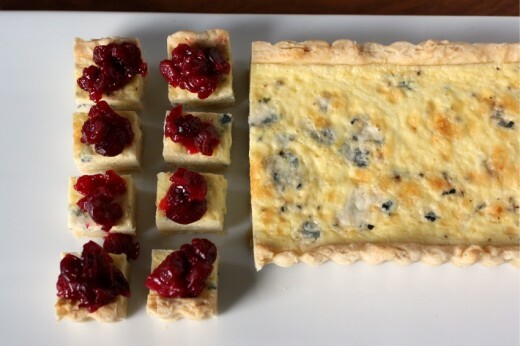 We are heading to Lopez Island with some dear friends and, seeing as I know there will be lots of snacking with four kids around, I figured it was time to try one of them out. I picked this recipe because it stars Old Bay Seasoning – something that Randy loves with all of his heart. Truthfully, it is not the Old Bay that he loves, but the Maryland crabs that come coated with the stuff – the ones he gets to eat every other July when we visit his extended family on the Delaware shore. This meal – “going out for crabs” – is one he looks forward to for 730 days. It is the same meal that I dread for 730 days. Imagine being a vegetarian at a long table covered with newspapers and mallets everywhere which are used to smash crabs into edible bits, claw sucking, meat flying… It’s not pretty. My dinner on that night is an iceberg lettuce salad followed by french fries and overcooked corn on the cob. This year they actually had “steamed rosemary potatoes” on the menu which I ordered, but I ended up eating french fries anyway. Anyway, Old Bay. I used to have a tin of Old Bay Seasoning hidden amongst all my spices. It was battered and a bit dusty and my hunch is that it was among the few possessions that were saved from Randy’s kitchen when our households merged. I certainly didn’t buy it – I’m not even sure you can buy it in Seattle. When I went to reach for it yesterday, it was not there. Where does a box of never-used seasoning go? It might be that I brought it to London when we moved there and if I did, it is in the possession of our downstairs neighbor’s housekeeper to whom I donated all of our spices and leftover food because you cannot bring any food item at all back into the U.S. when you move back from abroad. Not even canned goods. Not even dusty tins of spice mixes. So, thankfully the internet is useful for things like online banking and spice recipes. I looked around a bit and found that most of the Old Bay knock-offs feature a lot of celery salt, a moderate amount of paprika, and a pinch of just about everything else in your spice cabinet. I riffed on this one mostly. As this was baking in the oven and the smell of salty goodness started to spread around my kitchen, I started to get nervous. Why am I making something I know I cannot resist? And guess what? I cannot resist this mix. At least I know I am eating mostly goodness and no chemicals. In an effort to make myself feel less guilty about eating handfuls of this at a time, I used an all natural Chex-like cereal and Annie’s Cheddar Bunnies rather than the oyster crackers called for in the recipe. Oh, who am I kidding. I shopped at Whole Foods for the stuff and those were my only choices. Also, I have a giant container of pre-shelled pistachios in m pantry, so I threw some of those in and cut back slightly on the peanuts. Preheat oven to 250ºF. 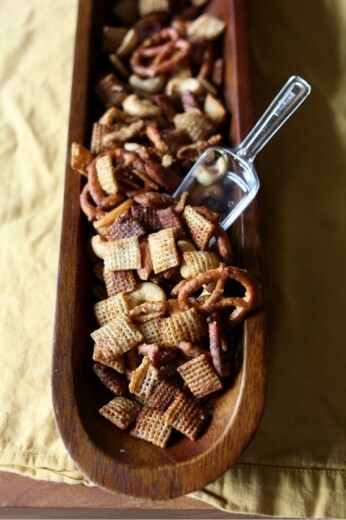 In a large bowl, combine cereal, pretzels, crackers, and peanuts. In a small bowl, mix together melted butter, Worcestershire sauce, Old Bay, lemon juice, and hot sauce. Pour butter mixture over cereal mixture and stir until ingredients are completely coated. 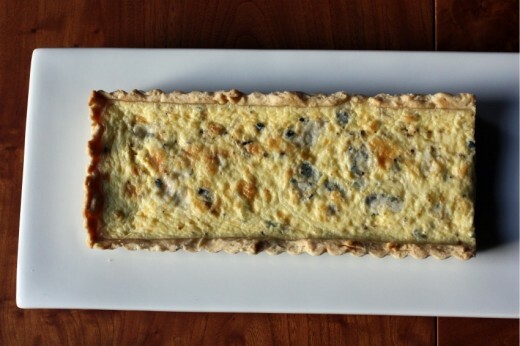 Turn out onto a very large rimmed baking sheet. (You might want to use two sheets.) Bake 1 hour, stirring every 15 minutes. Allow to cool, stirring a few times in the process. Can be stored in an airtight container for up to 1 week.